In this artist's impression, the host star is running out of hydrogen in the core. It is also losing mass, which causes the planets to move further out. The perturbation of the orbits may lead to collisions that will generate large amounts of rocky debris. 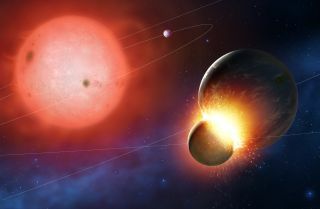 Astronomers have caught four dying stars in the act of chowing down on rocky alien planets similar to Earth, a destructive cosmic process that may one day play out in our very own solar system, a new study reveals. Evidence of the distant celestial meals was found around four white dwarfs — stars that are in the final stages of their lives. The stars are surrounded by dust and rocky debris from shattered alien planets that appear to have once shared very similar compositions to Earth, according to astrophysicists at the University of Warwick in the U.K.
"What we are seeing today in these white dwarfs several hundred light-years away could well be a snapshot of the very distant future of the Earth," said study leader Boris Gänsicke, a professor in the department of physics at the University of Warwick, in a statement. The dusty veils of material also contained an extremely low proportion of carbon, which is similar to what is found with Earth and the other rocky planets that orbit closest to the sun. According to the researchers, this is the first time that such low proportions of carbon have been measured in the atmospheres of white dwarf stars surrounded by cosmic debris. These observations indicate that the stars once hosted at least one rocky planet that has since been destroyed. The astrophysicists also determined that they are witnessing the final phase in the deaths of these alien worlds. White dwarfs are the compact stellar remains of relatively small stars, like our sun, that have exhausted their fuel, leaving behind dim, fading cores of material. The sun, and more than 90 percent of the stars in the Milky Way galaxy, will one day end up as white dwarfs, astronomers have said. The atmospheres of white dwarfs are typically made up of hydrogen and helium, so heavier elements that are incorporated into their atmospheres are dragged downward to the stellar core by its intense gravity, and are usually out of sight within a matter of days, the researchers explained. Since the astronomers were able to detect oxygen, magnesium, iron and silicon in the atmospheres of four of the white dwarfs, they must have been observing the final phase of the planets' death, as shattered material rained down on the stars at staggering rates of up to 2.2 million pounds (1 million kilograms) per second. One white dwarf in particular, called PG0843+516, stood out from the rest because of its seemingly overabundant stores of iron, nickel and sulfur in the dust in its atmosphere. Iron and nickel are elements typically found in the cores of terrestrial planets, as gravity pulls them into the center during the formation of planets. This suggests that PG0843+516 is in the midst of swallowing up the remains of a rocky planet that had a similar composition to Earth, the researchers said. "It is entirely feasible that in PG0843+516 we see the accretion of such fragments made from the core material of what was once a terrestrial exoplanet," Gänsicke said. Rocky material in orbit around a white dwarf star (center). Collisions turn larger material into dust, some of which then rains down on to the white dwarf. But while this process is occurring hundreds of light-years away, the cannibalistic scene could be a harbinger for the eventual fate of our planet. "As stars like our sun reach the end of their life, they expand to become red giants when the nuclear fuel in their cores is depleted," Gänsicke said. "When this happens in our own solar system, billions of years from now, the sun will engulf the inner planets Mercury and Venus. It's unclear whether the Earth will also be swallowed up by the sun in its red giant phase — but even if it survives, its surface will be roasted." As the sun sheds large amounts of its mass, the planets will migrate further out, he said, which will wreak havoc in the solar system. "This may destabilize the orbits and lead to collisions between planetary bodies as happened in the unstable early days of our solar system," Gänsicke said. "This may even shatter entire terrestrial planets, forming large amounts of asteroids, some of which will have chemical compositions similar to those of the planetary core. In our solar system, Jupiter will survive the late evolution of the sun unscathed, and scatter asteroids, new or old, towards the white dwarf." The detailed results of the study will be published in the journal Monthly Notices of the Royal Astronomical Society.